Happy Sunday! I've been really quiet here lately - Obviously at times we all get periods of feeling demotivated & personally I often get anxious, but I've learned to listen to my body and go with it when it happens rather than get disappointed with myself. I'm so happy to finally feel motivated again, today I'm planning new content ideas to keep me busy this month and next. If there's one thing that really bothers me, it's feeling stuck in the same place for too long. A real passion of mine is traveling and getting the chance to see as many new places as possible, each experience always leaves me feeling so invigorated and inspired. I stupidly hadn't planned any trips away this summer and I was going pretty stir crazy, but last week I booked a trip to Barcelona in August with my best friends - it seriously can't come quick enough! This city has been on my list to visit for so long and I know it's going to be an amazing holiday. 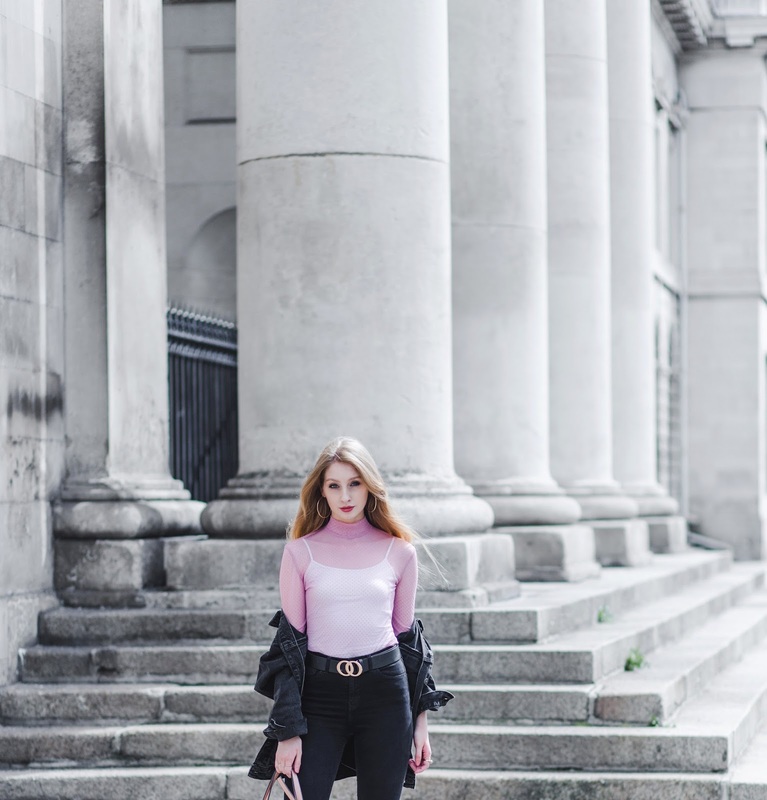 Today I'm sharing another outfit post shot by the amazingly talented Brid O'Donovan. She has such a great eye for location scouting and knew exactly what I was going for, shooting with her is always so easy and enjoyable! There's quite a bit going on in this outfit for me, but since I'm really loving both mesh and pink right now, naturally I couldn't resist this super cute bodysuit. You may notice the belt looks very much like a copy of another popular designer belt... until I can afford the actual Gucci one this Penneys version will have to do haha! I'm still finding the balance between my 98% black wardrobe and mixing in more bright, colourful pieces. I desperately do want to get out of my usual ways and wear more colour this summer, so I'm trying hard! In saying all of that, I may have also picked up this bodysuit in black.... just to be safe. I'm not sure if I've said this in a blog post before but I'm a huge photography fan and absolutely love getting behind the lens too. One aspect I have always loved is film photography and I'm going to introduce a 35mm film photography series onto the blog in the next couple of weeks. While a lot of it will be fashion based, I'll also be sharing photos I take on the go, compiling my favourite shots of each month together. I'm starting this project mostly to get myself back into taking photographs and having a creative outlet to go to every day, even if they're quick snapshot photographs. The quality of a film photograph just can't be matched by my phone or digital in my opinion! Happy Saturday and happy July 1st! It's so nice to finally see the sun and feel its warmth after an unseasonably cold but very typically Irish rainy week. 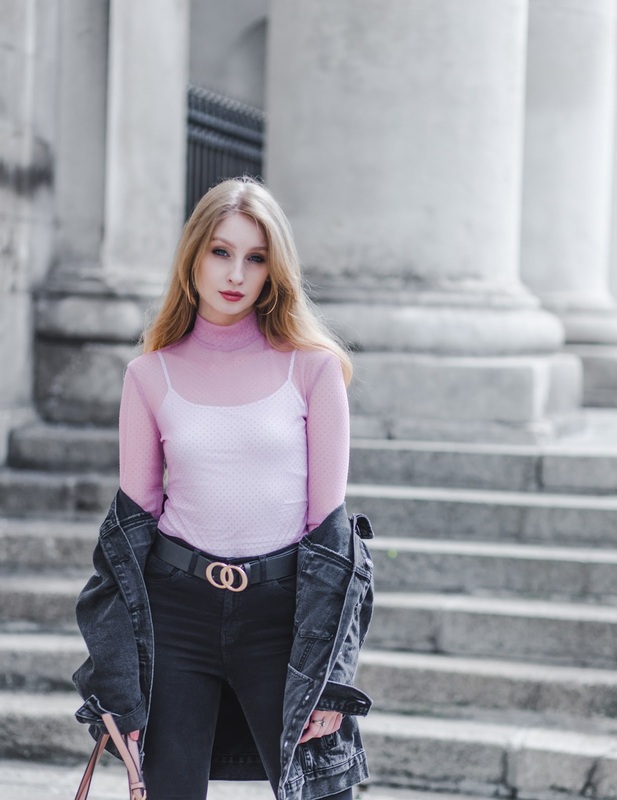 June was a bit of a mad month but I'm finally back with some new posts for the blog, starting off with this outfit post shot a couple of weeks ago by the amazing Bríd O Donovan! My June highlight has to be seeing one of my all time favourite bands Paramore in the Olympia, which also happens to be my favourite venue in Dublin too. While on the topic, if you haven't checked out their cover of Passionfruit yet, get on it! I always struggle with dressing for warmer weather as its such a (very welcomed) rarity in Ireland! As all Irish summers tend to go, one minute you're roasting and the next you're running for cover from the rain! As someone who usually feels the cold, this is pretty much my idea of a typical day-to-day summer outfit - simple, comfortable and with a jacket just incase!